There’s been a lot of changes in the mattress industry of late. While science and technology certainly have played a roll, the biggest change has been in the increase of factory direct sales. One company that is seeking to take advantage of the best that new and old has to offer is Saatva. They offer an ultra-premium mattress built with foam wrapped coils. They use a mutli-layer coil-on-coil system that incorporates memory foam along with the traditional individually wrapped coils, and combines them all with a European style pillow top. The result is a comfortable sleep at a competitive price point. Top Layer – Designed for comfort, this layer is made of a cover and a European style pillow top. We found the pillow top to be exceptionally soft and comfortable. Second Layer – The second layer of the Saatva is engineered to provide lumbar support. It’s constructed of a special type of memory foam. Even better, the layer isn’t thick enough to result in the heat retention qualities that turn some people off from memory foam mattresses. It’s also too thin to create the problem of excessive hug on your body. Third Layer – The next layer is designed for comfort and support. It is made of contour coils wrapped in foam. These coils provide the support of traditional innerspring mattress while at the same time offering the motion transfer control and contouring that foam provides. The result is a great night’s sleep, no matter what position you choose to get your Z’s. There are 884 individual coils in the queen sized mattress, which offers sufficient support for all kinds of body types and sizes. Fourth Layer – The fourth layer of the Saatva is designed for support. It’s made from high profile steel coils. These are the traditional steel coils you imagine being in a bed, and the Saatva has 884 of them in a queen sized mattress. Edge Support System – One of the more unique things that the Saatva’s construction permits it to do is offer a dedicated system of edge support. This can give edge sleepers added comfort and luxury while also providing the supported need for bedtime playtime. It consists of a layer of foam that wraps around all of the coil layers, protecting them while also providing a boost for support. As you can see, this is a construction design that’s not quite like any of the other mattresses on the market today, and certainly not like any of the mattresses that you might hope to find at the Saatva’s price point. The result is a high quality mattress that offers the support of coiled springs and the comfort of memory foam padding. The cover of the Saatva is made from 100% organic cotton. Cotton is a highly breathable textile, and it also has the advantage of being incredible soft. Some savvy shoppers may notice that it’s a similar cover to the one found on the Loom & Leaf, but there are some differences. One of the most important differences is the fact that the cover on the Saatva features a Euro-style pillow top. This is a great way to add softness to a mattress, and the Saatva does a great job of taking advantage of the technique without going overboard and ruining the benefits they garner from the rest of the mattress’s construction materials. Euro-style pillowtops are different from regular pillow tops in how they are built and the way that they look. 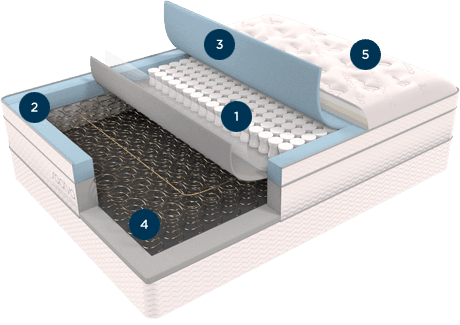 Traditional pillow tops are sewn to the top of the mattress, whereas the Euro-style pillow top is inserted underneath the cover and aligns to the edge of the mattress. Not only does this give the Saatva a sleek, streamlined look, but it also gives better durability to the mattress because this type of construction is less likely to lose shape over time. It’s important to note that Saatva changed their cover in 2016. This means you should be careful to check the date on any reviews that you find to ensure you’re learning about the new cover and not the old one. The new cover featured tighter quilting in the center to provide greater lower-back and lumbar support. Moreover, this construction method and the resulting support are better at helping sleepers maintain their spinal alignment. As a result, this mattress can be a good option for anyone who wakes up with back pain or suffers from other back injuries and need to be careful about the position their body is in. Saatva Plush Soft – This is the softest option for mattresses offered by Saatva.it’s best if you prefer a soft mattress, are a side sleeper, or like to feel hugged by the mattress you’re in. The extra softnes comes from wrapping the top layer of coils in a much softer conforming foam. Saatva Luxury Firm – The luxury firm is Saatva’s middle of the road firmness option. That means it’s best for people who don’t find themselves at either extreme end of the firmness scale, and it’s broadly similar to the type of bed you’ll find staying at a nice hotel. It’s a good choice for all sleeping positions, and also works well for people who change positions in the night. Finally, it’s an excellent compromise choice for those who sleep with a partner who has a different idea of how firm a mattress should be. Saatva Firm – The Firm is the firmest mattress Saatva has on offer. The added firmness comes from wrapping the top layer of coils in extra-firm foam. It still feels soft when you initially lie down, but you rapidly encounter more support than the other options provide. 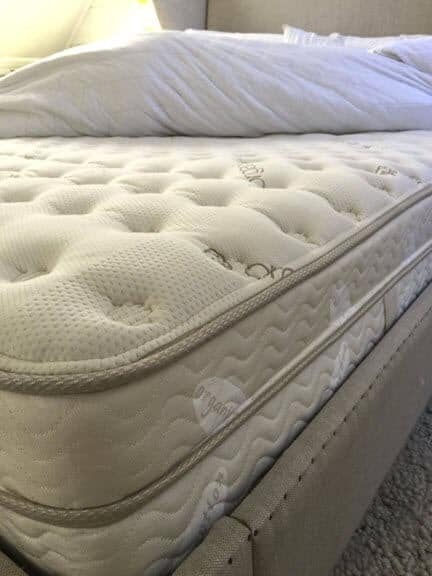 This mattress is best for people who sleep on their back and stomach, like to hover on top of the mattress, or who like or need a very firm mattress. On a scale of 1-10, with 1 being the softest and 10 being the firmest, the Plush soft rates as a 3.5, the Luxury Firm comes in at a 6, and the Firm would be rated as an 8. This means that no matter what type of mattress you prefer or need, Saatva has an option to accommodate you. One of the things that is good about the Saatva is the fact that the pillow top allows for a soft feel at first, and then the mattress offers the support of the pocketed contour coils. The coils are one of the things that helps make this mattress unique. Most companies don’t construct coil mattresses anymore. Moreover, the companies that focus on online sales certainly don’t make them. That makes Saatva something of an anomaly in a lot of ways, but sometimes it’s good to be different, and we think this is one of those times. Because it’s a coil mattress, there are some other things that set the Saatva apart. The Saatva has more bounce that most, but that also means it has more motion transfer than you would expect from a foam mattress. The construction methods used mean that it’s not as extreme as an older model spring mattress would be, but it’s worth noting. Another thing worth noting is how much fun a bouncy mattress can be. It makes adult bedtime fun a much more pleasurable experience, and one you’re not likely to get in other mattresses at this price point. The final thing to note is the cooling that a spring mattress provides. A spring mattress uses much less foam, and the coil-on-coil construction offered by the Saatva means that there’s great airflow, helping cooling. This makes it an appealing option for people who are warm or hot sleepers, or if you just think that foam mattresses are always too hot. The combination of foam, pillow top construction, and springs lets you enjoy the best qualities of each system, while reducing many of the potential drawbacks. Like most mattresses, the Saatv price is based on the size of the mattress. The different firmness levels have the same price as each other at a given size. If you do a comparison to mattress stores, most of the comparable options are in the $2,000 to $3,000 price range. On the whole, the Saatva offers good value for money. It’s best for people who are looking for a bouncy mattress or those who find foam mattresses to sleep too hot. 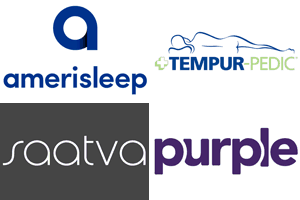 The Saatva comes in a range of different degrees of firmness, which means that no matter how firm you like your mattress, they have an option that works for you. Finally, the price point and the fact that there really aren’t too many people doing coil mattresses these days, and certainly not online, make this a solid choice for many different sleepers.